participate in this ultramarathon sometime in the next 5-7 years. I had no clue when it would happen because I had no clue about ultras and no idea how I would know that I was ready to take the plunge. I just knew that it involves slow scaling up and a lot of training…like any distance and more! So I just put this on the back burner. And then I decided to run some 50K ultras because I had already been running for two years, had run many half marathons and four full marathons, and wanted to go beyond the marathon distance to challenge myself..and also because I wasn’t getting any younger. Over the next two-plus years came three 50K runs, 12-hour Mumbai Ultra, and 100K Pune Ultramarathon. I was of the opinion that there are so many good ultras in India. Why should I go for Comrades? But meanwhile, some of my friends from Pune and Mumbai did this run and spoke about the six cut-offs besides the finish cut-off of 12 hours and the hilly route that make this run so challenging and acclaimed. And it became even more a question of “why not when you can”! 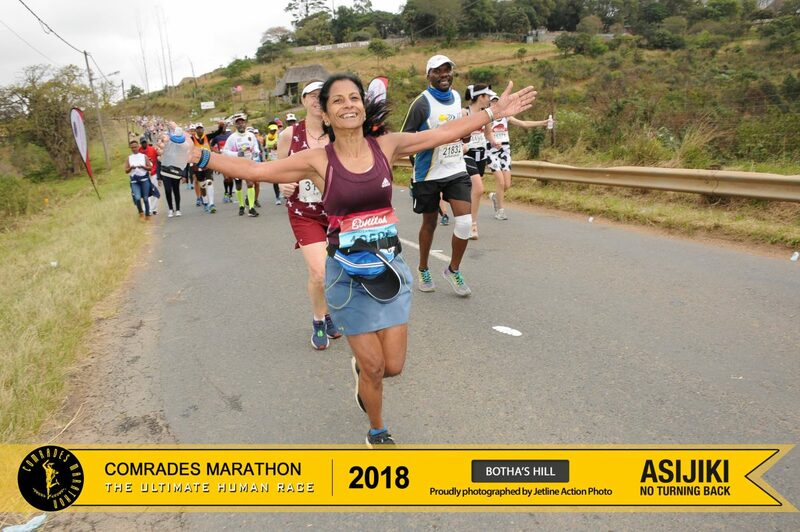 So I decided to take on this challenge and experience for myself the famed transformation that this race brings; the ultramarathons in India are not going away anywhere, and I hope to run those too after I am done with Comrades. Hubby, Chandan, wouldn’t let me go alone. So we decided to do the “Down” run this year and make a vacation out of it. I must clarify the ‘down’ part : Incidentally, as my Garmin record shows, this “Down” run has an elevation gain of 1077 m and elevation loss of 1693 m; with hardly any flat along the route, five named hills and numerous unnamed ones! And to make things not easier, the run turned out to be of 90.184k – longer than the earlier down runs by about a km to have a stadium finish. Registration happened in Sept 2017, and within a couple of months we had explored the flight and hotel options and booked them. We also planned a vacation after the run, so we booked a safari package too, about four hours from Durban because we had already booked the return from Durban in Emirates. Emirates also arranges for Dubai visa, so we decided to stop there too on the way back for a couple of days to make this one of our favorite ‘vacathons’. Yes, one can’t just register and walk into Comrades! Although there are many qualifying distance options, most people qualify by completing the full marathon distance in less than five hours on an officially certified route. I ran Bengaluru Marathon in 4:24 during my longest training weekend three weeks before the 100K Ultra – and qualified. Although I had run a 100K ultra in Nov last year in 13:54, I knew that the training that I did then entirely on my own wasn’t going to be enough. The way I had run that ultra without a strategy for the run day wasn’t going to work here. So I enrolled with Motiv8 Coaching under coach Atul Godbole. My training for Comrades began in beg-Mar after the Delhi full marathon. Comrades training typically includes one really long run each month from Feb to May and other long, slow, speed, and hill runs each week. Additionally, there was one Sinhagad hill run each month. Two weeks into training – mid-Mar – I headed for a 3-week vacation to Melbourne. Training for so many months demands a lot of patience and sacrifices from the entire family. I had to do my longer weekend runs during the week so that we could see places on the weekends when my daughter and son-in-law had their weekly offs. Running in another country is always challenging for want of support and comfort with the routes. I did my longest run for March, a run of 55K, self-supported and all alone in Melbourne. Of course, this run had 3 different loops that finished at home and my daughter and husband ensured that whatever I needed was available there. We also did very long walks there on small hills, and I believe that this cross-training helped! The remaining training happened in Pune with other runners from Team Motiv8 with excellent support. It is a blessing to be a part of a group with such well-organized support by team members for such long runs. We did our long runs on ghats to give us the required training to run uphill and downhill as during Comrades. The coach grouped us as per our pace and we mostly ran in pairs. I always ran wearing the kind of gear I would wear for the actual run. I carried my water bottle and wore a waist pouch carrying the required gels and salt tablets. I had bought new shoes in Melbourne and started training in them in the last week of March. No change in brand, I used to wear Ultraboost earlier, and this was Ultraboost X – I like these specifically for the wider toe box. I regularly followed Coach Parry’s webinars although similar information was forthcoming in our conversations with the others in the group who had run Comrades earlier and in the India Comrades WhatsApp group too. However, it is important always to filter out the noise and stick to one’s own training plan, which is what I did. I am very injury-prone and long distances come with their own challenges. I went into training with this foot-ankle injury. I started seeing a physiotherapist in mid-Feb to take care of this injury and deal with my limited hip mobility. To make matters worse, I also had very tight hamstrings and calves. Through the training period, I had physio sessions twice a week and also took needle treatment to release the muscles that were very tight. My coach and physiotherapist recommended some additional exercises that I did on alternate days. Additionally, there was the weekly massage and foam rolling whenever I could get over the boredom of doing it! Each monthly long run and second longest run left my foot slightly swollen and hurting badly, and I had to miss 1-2 weekly runs during the next week for its recovery. I replaced them with cycling occasionally after consulting the coach or just rested. Also, my monthly long runs were 5k shorter than those of others. I also had one lesser weekly run. The training plan was customized to take care of my longer recovery period. Some low fever and throat infection too happened twice in four months – once just 15 days before the D-day, which made me nervous – but I took antibiotics and just rested it off. I had hurt the ligament of my left wrist, and so couldn’t do many of the Ashtanga yoga asanas. Hence, I stopped the yoga classes. Other than the three weeks we were in Melbourne, for most of the time from Feb to June, I did two days of strength training in the gym and two days of yoga at home. I also joined a Pilates class for two days every week. This really helped me with balance and alignment as well as correction of posture and increase in core strength. Both of these are a challenge for me. I don’t sleep enough and I take very few complete rest days. However, I took conscious effort to get the required sleep. About rest, there were times when I went through three weeks without a rest day – not an ideal thing to do. However, I had light days and heavy days, and I was mixing activities, mostly running 3-4 days a week other than for a month around March when I ran 5 days a week. I am basically a foodie, so I had to exercise a lot of restraint and reduce the excess carbs and junk that I eat and balance it with fresh fruits and vegetables as well as more protein. I took Unived Lean Pea protein after each run longer than 21K and each HIIT session. I also regularly took multivitamin, calcium, and omega tablets. My immunity goes down after a very long run, so after each monthly long run, I took 1000 mg of Vit C for a week. I got my regular tests done and D3 had gone down, so I started with Vit D tablets too. During my longer runs, I took an RRUN gel after 12k and then every 9-10k. I also took an RRUN salt tablet every hour. Besides this, I had the electrolyte mix and water as needed in small portions. Pre-run would be two bananas after waking up and a few almonds with tea. Post-run, lean pea protein was a must for me. I trained as I would during the run. There was an occasional bite of banana or a couple of pieces of boiled potato sometimes. In the last couple of months, I even drank coke in the last 20k to see whether it suits me, and it did. During runs shorter than 28k, it was mostly water and some electrolyte mix the day we had the luxury to do loops. I never run any event with a specific target in mind; I don’t follow any specific pace. I normally just do my best for the day, some days it’s good and some days it isn’t so good. A week before we set out for Durban, coach Atul assigned a target of Sub-11 to me. A target of 11 hours meant that I would have to run at an average pace of about 7:18 min/km. I went back to check my pace during the long runs. The maximum elevation gain I had covered was 971 m during the 60 km run, but the pace was 7:26 min/km. I reasoned with myself that this was during training and I was running on tired legs. Besides, the training incline was relatively higher than of about 1100 m on the Comrades ~91 K that I would run. In such a long run with varying gradients, there is no real running at one steady pace in the absence of flats. I went through Coach Parry’s pacing chart to try and remember some of the cut-offs for my target finish. Anything beyond that didn’t matter much, and then I would just run for a finish. I just decided to ensure that I try to stay below the average pace of 7:15 min/km. I studied the route map as well as the 2016 run details that Atul had shared from his own 2016 run Garmin record and identified distances that had more than 3k of continuous hill so that I would use the hill strategy there. So the theory was now in place, easier said than done! With a heart, mind and body in place, Chandan and I set out for South Africa! Blog 2 will be all about Running the Real Race! See you soon! 54 year old Taru finished her BE (Instrumentaiton and Control), got married to an army officer and had a checkered career while she traveled all over India: she's been a school teacher, a college lecturer, a research assistant, and an NIE consultant before she got into IT. She was at the helm of her career as a Delivery Head when she took premature retirement last year. She i snow a freelancer pursuing her passions. Passionate about learning, she also completed BEd, MEd, PMP, CSM, and three levels of Spanish. Thanks. Wish you all the best! Hats off to your commitment and an amazing guide .. Hearty congratulations.. Incredible.. I want to get added in WhatsApp group of Camrade Marathon. If possible please add me to the group or suggest the way to get in. Runners are added automatically when they register for the Comrades run. All the best! Great mam,congratulations.we mate during pune talks with moti8 group function. I am planing to go in 2019 for same need your help . Thanks. All the best. Help always forthcoming. Well pinned down. Waiting for part 2 of Comrades Marathon . Congratulations and hoping to see u and Chandan Sir at SPBM.